Responding to a facebook viewer request, Wayne prepares grilled pineapple and peaches for a flavorful dessert. 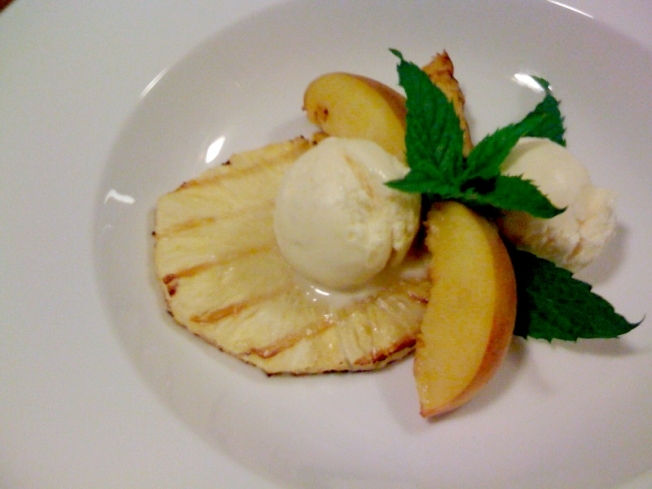 Wayne's Weekend: Grilled pineapple and peaches over vanilla ice cream with fresh mint. I’ve really enjoyed getting ideas from my facebook friends. This week I wanted to do something on the grill but I decided to take requests. Angela DiAnna suggested I work on some grilled fruit ideas and I thought that was a great idea. I’ve created this dessert with pineapple, peaches, fresh mint and ice cream. It’s easy to prepare and loaded with flavor. The warm, smoky caramelized fruit and the icy cold vanilla ice cream are a wonderful combination. Prepare your grill (either gas or charcoal) to a medium-high temperature. In a small bowl, combine brown sugar and granulated sugar. Set aside. Cut the top and bottom off of the pineapple. Standing it vertically, cut the rind away in vertical strips, removing the eyes but leaving as much of the flesh as possible. Lay the pineapple on its side and cut it into 1/2” slices. Plan on using 1 slice per serving (store the remainder for another use). Lightly spray each side of slices with canola oil. Sprinkle about 1 teaspoon of the sugar mixture on one side and set aside. Slice the peaces in half and remove the seed. Spray the cut surface with canola oil and sprinkle about 1/2 teaspoon of the sugar mixture on top. Place pineapple slices and peaches on the grill, sugar side down. Top pineapple slice with additional sugar and a few mint leaves. Cover grill and cook for about 5-6 minutes or until pineapple surface is caramelized and has nice grill marks on it. Grills vary greatly, so be careful not to overcook the fruit. Remove mint and flip the pineapple slices. If peaches are already softening, move them away from direct heat. Cover and cook for an additional 5 minutes. Remove fruit and place peaches on a cutting surface and carefully slice into wedges. To serve, place a piece of pineapple on a serving bowl. Top with 1 or 2 scoops of vanilla ice cream and a few peach slices. Top with fresh mint. If you have any questions, comments or other ideas you’d like to see in a future segment, please send me an email at wayne@waynesweekend.com or follow me on facebook.